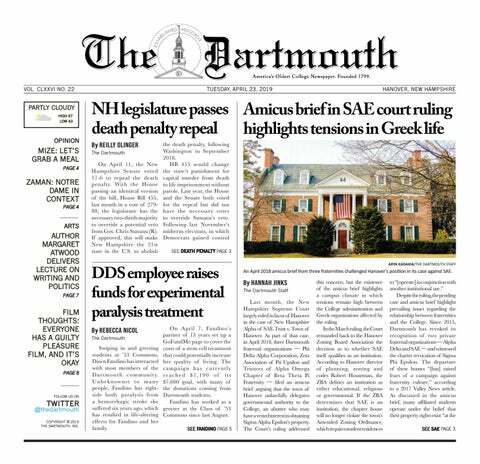 This week, The Dartmouth’s Henry Arndt went one-on-one with Kat Ramage ’19 of the women’s rugby team. This year is women’s rugby’s first as a varsity sport at the College. The Big Green has split its first two games as a varsity outfit. Ramage delivered a standout performance in the season-opening win over the University of Pennsylvania, scoring a try and notching four conversions for a total of 13 points, second on the team. How did you first get interested in rugby? KR: The first time I ever played rugby, I liked it a lot. We did contact the first practice, which was really fun for me because it was aggressive, and I like that. I started playing after that, but I didn’t get serious until after two years of playing. When I was 16, after playing for two years, I got invited to play in Las Vegas for my first elite team [with the junior All-Americans], which was pretty awesome. I got an invite to high school All-Americans that same year, and that’s when everything started and I got really serious about rugby. I played on a club team 20 minutes from my house, and my teammate and I started traveling together and going to a lot of different rugby events around the world. When did you decide on rugby? KR: I was a high school All-American two times and a women’s junior All-American. For high school, they pick the top 50 rugby players from all different tournaments and you all come together and play at a camp and then they pick an all tournament team. For women’s junior United States team, they picked around 30 girls and we competed and played against Canada. When I first got high school All-American, I was named captain. That was a big moment for me because I got to lead some of the best players in the country. That’s when I decided I really want to do this and I really want to put everything I have into being a really good rugby player. What was it like being recruited at a school for a new varsity sport? KR: Dartmouth wasn’t varsity yet when I was recruiting my senior fall. Everyone was saying they had hopes to go varsity, but they weren’t sure yet. I wasn’t sure about what I wanted to do, and I knew Dartmouth would be switching coaches if they became varsity. I didn’t want to be in a situation where I didn’t know who my coach was going to be or where the program was going. So I committed to a different school, Lindenwood [University], where I knew the coach and knew the program was going to be really good. In July, when I found out [Katie] Dowty was coaching, she told me a bunch of stuff about Dartmouth and how their women’s rugby program went varsity. After talking to her I switched over and now I’m here. A week after she was announced I switched and joined Dartmouth. What impact did the coach have? KR: Dowty has coached me at a lot of All-American events. I really like how she coaches, and I love her playing style and what she brings to a team. I was at a residency in Arkansas the whole summer, trying to make my decisions, and there were a lot of older girls there, 28 or 30 [years old]. They really helped me when I was trying to make my decision about college so that was awesome. Dowdy coached at Central Washington University and she brought their team to the final four last year. Hopefully she can start something like that here. She likes to coach a really creative style of rugby and not just the same style all the other teams do, which is really fun to play. KR: In the Penn game, since we didn’t face a really hard defense, we were able to execute our pattern that we’ve been working on for a long time. Against Quinnipiac, it wasn’t really the same because they had a lot of defensive pressure, so we struggled with that a little bit more. Against Penn, we were definitely able to work on what we needed to work on. Quinnipiac has been varsity for longer than us and they have five or six All-Americans. They have a really good team. I think our first half went really well, it was 14-5. In the end, it just came to fitness being our biggest problem, but we’re working on it this week.